The Toptable Group of restaurants has some of BC’s finest dining establishments under its belt. Some of them include Thierry Chocolaterie, West, CinCin, Blue Water Cafe and Araxi. 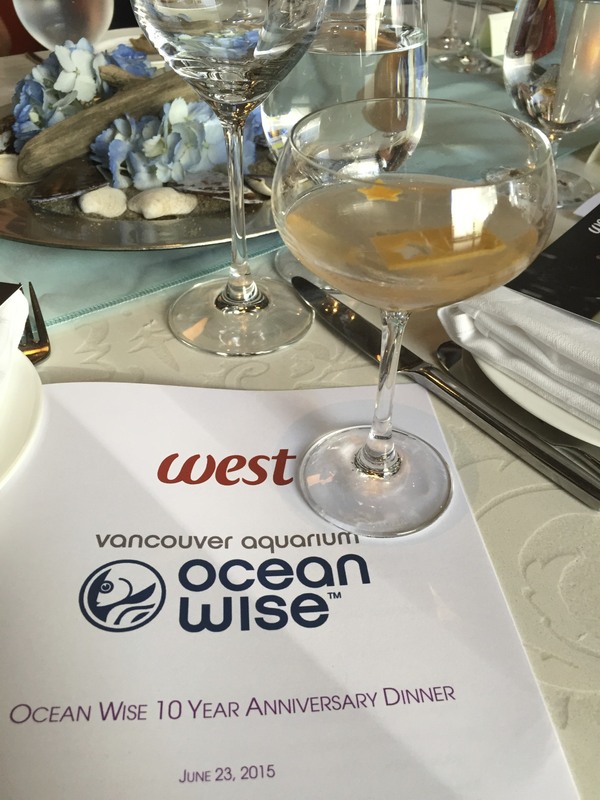 As founding members of the Vancouver Aquarium’s Ocean Wise conservation program, Toptable Group restaurants and their chefs have long championed sustainable seafood practices. In honour of the 10th Anniversary of Ocean Wise, each Toptable Group restaurant featured a showcase of British Columbia’s finest sustainable seafood products throughout the summer season. I was lucky to get an invite to the dinner at West Restaurant and Bar. The menu was a partnership between West’s Executive Chef Quang Dang and the legendary Chef Robert Clark, an Ocean Wise founding chef and currently an owner of Vancouver’s sustainable seafood store and eatery, The Fish Counter. 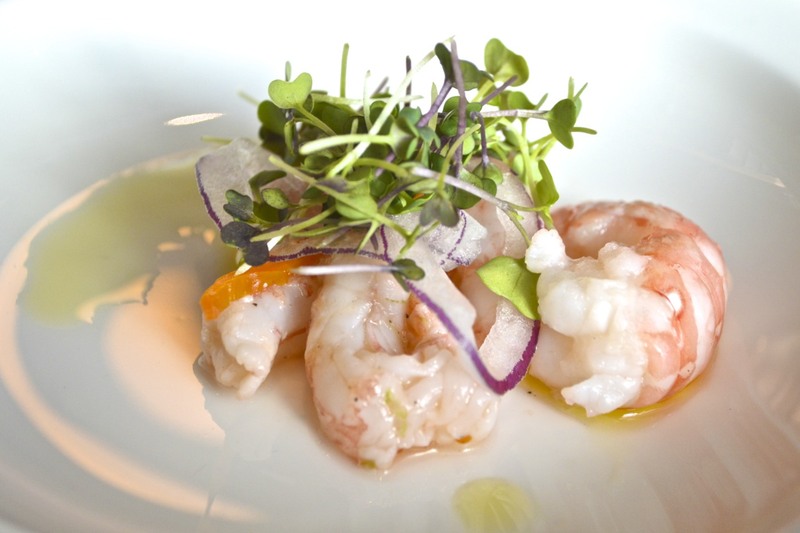 The event began with a sparkling wine and canapé reception, followed by a six-course dinner prepared by the two chefs. 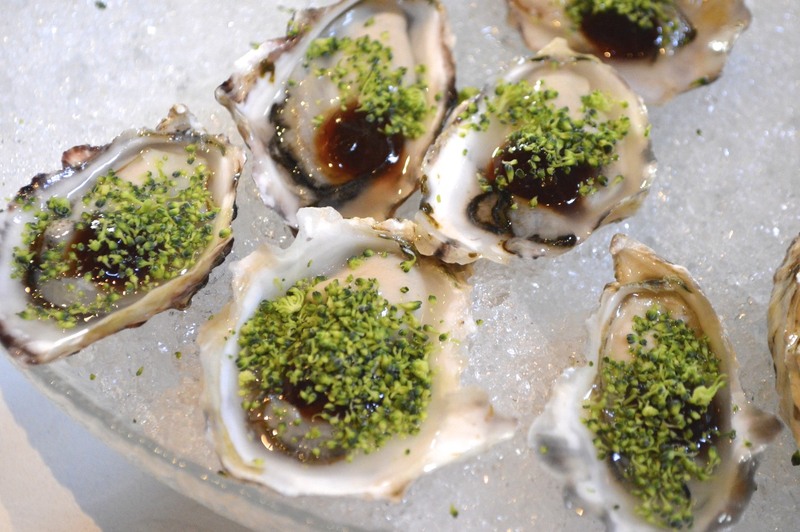 Some of the canapés included fresh shucked Sawmill Bay oysters with broccoli and drizzled with ponzu sauce. We had the pleasure to sample Sabrine Dhaliwal’s award-winning James Bond–inspired martini, Pink Skies at Night Our first course was created by Chef Robert Clark – Side Stripe Shrimp Ceviche. It was lightly seasoned with Aji Amarillo, a Peruvian spice; and served with baby greens with a drizzle of extra virgin olive oil. 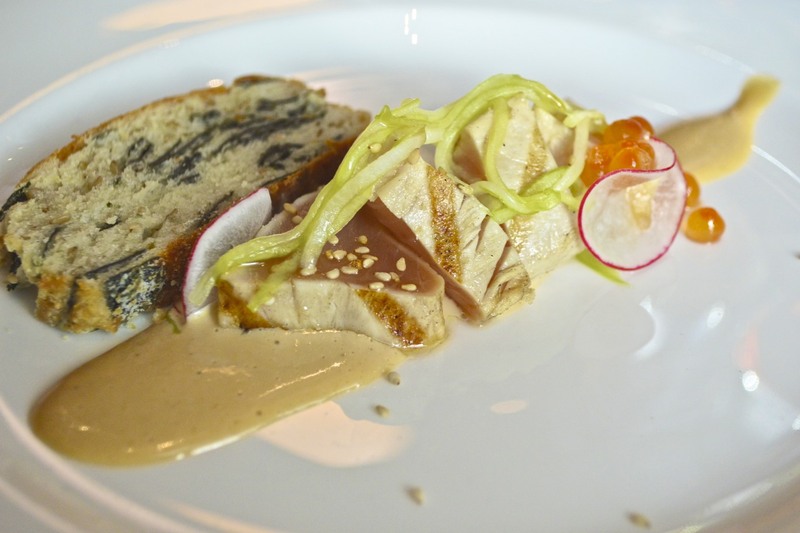 Second course, also by Chef Clark was the Albacore Tuna Tataki served with a Nori scone, salmon roe, and cucumber salad. The next course was created by Chef Quan Dang. 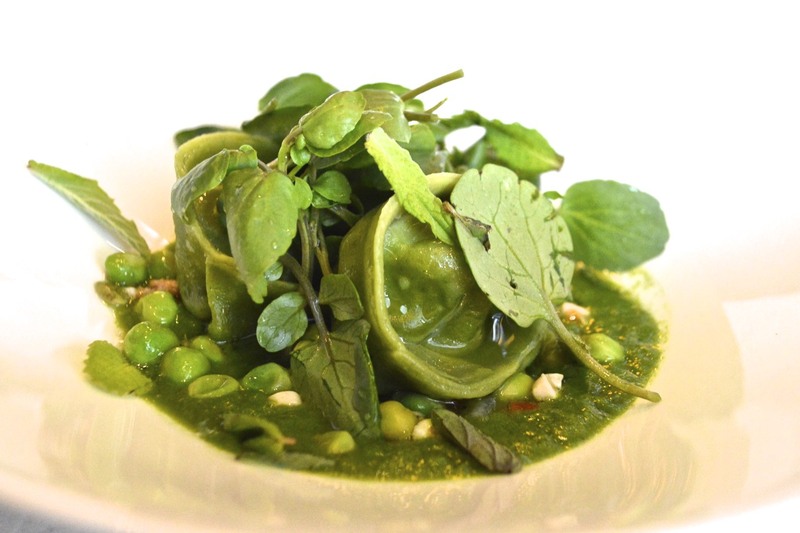 Dungeness Crab Tortellini with English peas, mint, in a watercress sauce. The tortellini was delicious filled with crab, and the mint was great with it. 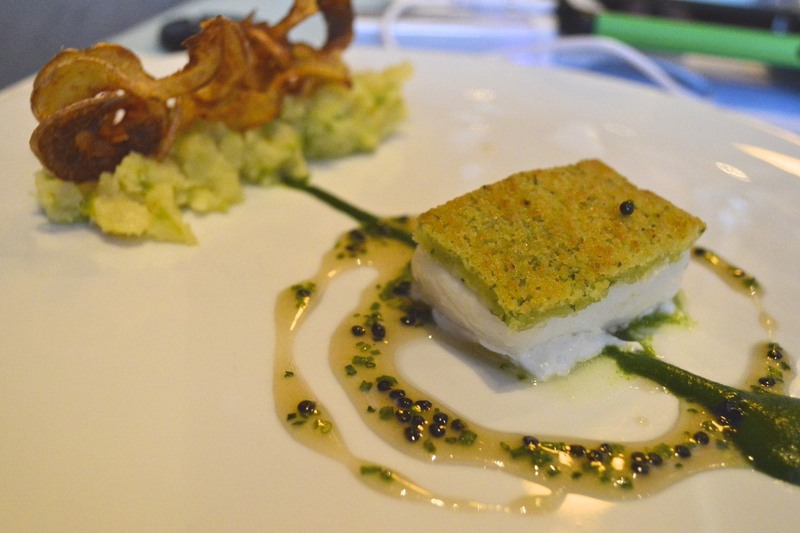 Another hit by Chef Dang was the Chive-crusted Cape Scott Halibut served with crushed fava beans and fingerling potatoes in a Northern Divine caviar vinaigrette. 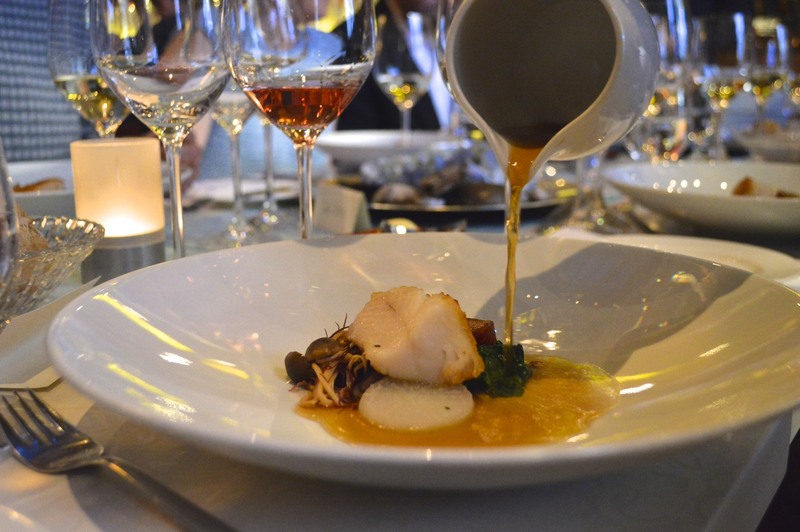 For our final course we had Chef Clark’s Wild BC Sablefish à la Plancha. It was served with pickled mushrooms and braised daikon in a dash broth. This Spanish-inspired fish was seared to perfection and the presentation was beautiful. 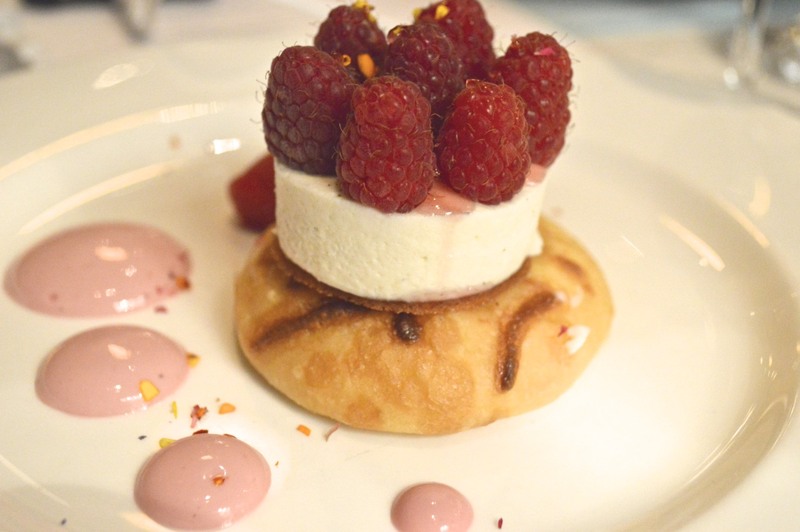 The finale was the most sublime dessert made by Pastry Chef Rhonda Vianni – a fresh raspberries with buttermilk brioche, white chocolate lemon mousse, floral syrup, and raspberry sorbet. Perfection.